If you want to skip the words, the review is under the cut ^^, a super quick tl;dr summary is at the very bottom! I love winter. I wouldn’t say it’s my favourite season, since I am a summer baby and my wardrobe is approximately 98% better equipped at dealing with heat than cold, but winter is the season I get to hide in ridiculously over-sized jumpers and snuggle into scarves. My skin, however. My skin does not love winter. I’m one of those people that never grew out of their eczema, and during the winter time I suffer from a combination of eczema and Very Dry Skin – it makes me incredibly self conscious when they flare up in tandem. Thankfully, in England, I can just pop down to Boots or Superdrug or a supermarket chain and pick up an intensive moisturiser and a little tube of Hydrocortizone cream or Sudocrem for the most problematic areas, and the cumulative price is generally under £10. Unfortunately, in South Korea, I can’t really do the same. Luggage restrictions didn’t really allow for an industrial sized tub of the stuff, and import laws are stricter than you’d think on prescription-type medicines. What I can do though, is explore the wide and very diverse range of skin creams available to me over here, which was a daunting enough task in itself, to be quite honest. While I am very well versed on what a lot of the makeup products here aim to do, I am definitely not up to scratch with my knowledge of skin care products. 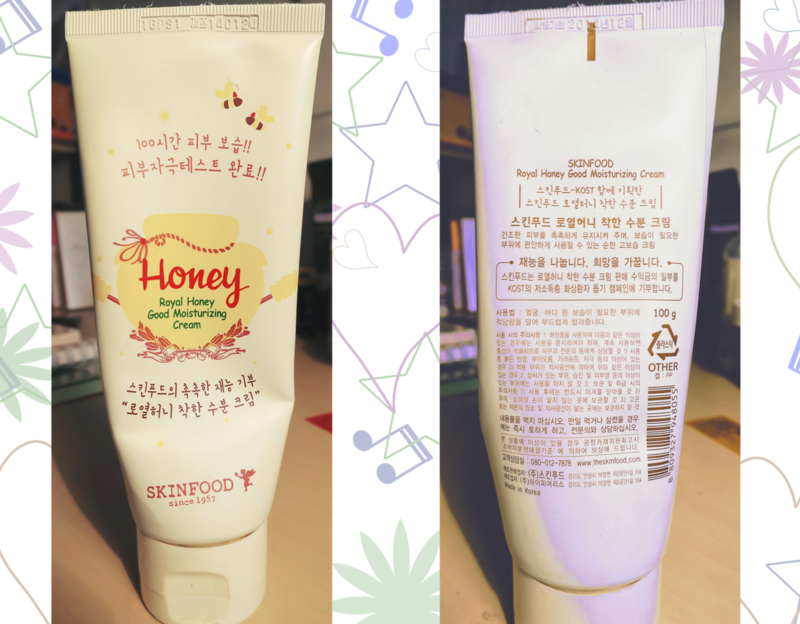 So as the title of this post suggests, I picked up the Royal Honey Good Moisturizing Cream. It cost me 13,000. Apologies for the website being the Korean version, but as things in Korea go, if you speak Korean you get more Korean stuff – aka, the English site doesn’t list it. Koreans do love their packaging, so the product comes in a tube in a box that claims ‘100 hours skin supplement’ and that it’s ‘gentle and highly moisturizing’. On one side it has usage instructions (in Korean) and the other, it has the ingredients (in English). The tube is a snap cap, so there isn’t any chance of you leaving it unscrewed and the product drying up. It also comes with a silver tab covering the nozzle that you have to remove before first use, which I like, as it shows if the product is brand new or not, (though in a cosmetics shop why would it be used…) or has been damaged in the factory. The cream itself is scentless, which I like, as I find some creams that are overly perfumed either irritate my skin or my nose, or both. The consistency is quite light, and doesn’t leave any visible residue on the skin, though you can feel it after application. There’s also a slight shine where the product has been applied, which I hope is visible in the photos. I’ve had this cream for about two weeks now, and have been applying as per direction (liberally, whenever my skin feels dry), to the more troublesome areas of dry skin that I have – mainly the crooks of my elbows and certain areas of my face. There has definitely been an improvement on my elbows, but I still have some patches of dry skin on my face that haven’t improved as much. Overall, I like this product, though I’m unsure of whether I’ll buy it again when I use it all up. I’d give it a rating of 3/5, purely because I think it’s a little pricey, and the residue left over from application feels quite greasy on my fingers. "Garosu-gil & edae + mini haul"